The profitability of TJX's European business has been slipping recently -- but Europe remains an important long-term growth opportunity. In the U.S. market, off-price leader TJX Companies (NYSE:TJX) and its smaller rival Ross Stores (NASDAQ:ROST) are pretty evenly matched. TJX has more than twice as much domestic revenue as Ross Stores but has a slightly lower operating margin. Both companies have generated strong sales and earnings growth in the U.S. for many years. 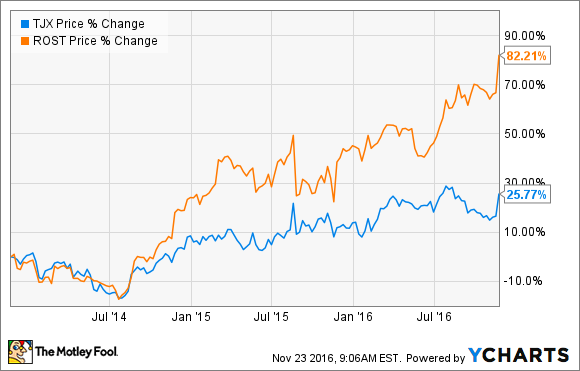 Despite this relatively comparable performance in the U.S., shares of Ross Stores have more than tripled TJX's gains over the past three years. TJX Companies vs. Ross Stores Stock Performance data by YCharts. Much of this disparity can be attributed to TJX's European operations. TJX's large footprint in Europe represents a unique growth opportunity for the company. Yet the profitability of this division has been very inconsistent -- and has declined significantly in recent quarters. TJX's three North American divisions all routinely produce strong margins. Marmaxx, which includes the T.J. Maxx and Marshalls chains within the U.S., has posted a 14.2% segment margin so far this year. Despite being a less mature business, the HomeGoods chain in the U.S. has earned a solid 13.5% segment margin year to date. Finally, TJX's Canadian operations have earned a 14% segment margin. Looking back over the previous three years, all three segments posted operating margins between 12.9% and 14.6% in each year. TJX's U.S. chains are all highly profitable. Image source: The Motley Fool. By contrast, TJX's European operations have never managed to reach double-digit margins. TJX Europe posted a 7.2% segment margin in fiscal 2010, but it ran into problems in the following two years, causing segment margins to fall to low single-digit territory. TJX slowed its European expansion in fiscal 2013, helping margins to rebound, before accelerating its growth again. For a while, TJX seemed to be back on track in Europe. In fiscal 2015, the TJX Europe segment margin climbed to 8.2% while revenue surged 13%, primarily driven by store openings. But the rising dollar, Brexit, economic uncertainty, and growth investments have started to undermine TJX's performance in Europe in the past two years. Roughly a year ago, TJX acquired the small Trade Secret chain in Australia. As a result, TJX now combines its European and Australian results in a new business segment called TJX International. Through the first nine months of fiscal 2017, this segment's profit margin has slumped to 4.6% from 6.5% a year earlier. Much of that decline can be attributed to currency swings, as well as the lower profitability of the Trade Secret chain. Furthermore, as TJX has expanded into new countries in Europe -- it entered Austria and the Netherlands in 2015 -- its profitability has taken a short-term hit. Nevertheless, the fact remains that TJX is not meeting expectations in Europe. It's not that surprising that Ross Stores has dramatically outperformed TJX stock over the past few years when you consider that TJX's European profits have plunged in the past two years. Many investors prefer Ross Stores' more predictable earnings growth. Ross Stores has reported strong profit growth in recent years. Image source: The Motley Fool. However, TJX continues to gain market share steadily in Europe, although economic conditions have driven significant variability in its comp-store sales growth. It is the only major off-price retailer there, whereas it faces competition from Ross Stores and several smaller off-price rivals in the U.S. If anything, that should be a positive for TJX's long-term margins in Europe. TJX has expanded its store count by about 50% in Europe over the past four years. This clearly has had a negative impact on profitability, as it takes a few years for new stores to mature to peak profitability. In the short run, TJX may find it prudent to slow this growth in order to get its margins back on track. But in the long run, the company sees opportunities to roughly double its store count in Europe, even without expanding into any new countries. It may take a few years for economic conditions in Europe to rebound and for TJX's investments there to mature. But while currency volatility may sabotage TJX's profitability in Europe from time to time, in the long run, Europe is likely to be a valuable contributor to the off-price giant's sales and earnings growth.